With a crew that absolutely loves the outdoors – beach, mountain, desert … heck they might even like a rainforest (never been with the whole gang.) Mother Nature has an influence on our lives. We wish the best for those in the mighty Mother’s path. With the most visible storm making landfall to our friends on the mid eastern coast line, and one of our far west states/islands are also dealing with her muscle flexing…. Next week we continue our found series (PLUP, Emergency Fund-) with the last depending part, the High Deductible. Thanks for all the responses, we have greatly enjoyed sharing and will have full versions in the coming Q4 Newsletter. Of course it’s a Tennis weekend, but long time followers will be surprised to know this weekend unusually includes little Brother in a Sunday match while older sister watches and gives important advice…..
Today is a Friday, enjoy your day and the weekend .. be safe and talk to you next week! Insurance can be a costly word to many, but in this post we discuss in an abbreviated form from our coming Newsletter, the PLUP – You may not want to leave home without it! This coverage is an add-on to your auto or homeowners policy. This coverage kicks in as a pseudo major medical similar upper limit coverage for liability should you need the extra protection. Given the cost, it is easy to see this coverage is not utilized frequently, but had the personal experience above been slightly different, maximum limits could have easily been met, needing the Umbrella for continued asset protection. Another neat and settling feature of the PLUP is that it mandates that your standard or base coverage are correct. The reason for this is that the Umbrella Policy actually sits on top of your standard coverage, again similar to a major medical policy sitting on top of your standard health coverage, to only kick in when the base coverage are maxed out. The most obvious assets at risk are after tax dollars such as checking, savings and investments including Revocable Trusts. In a bad situation, without the PLOP policy these assets may be at risk in the event of a liability judgement is made on you. The crazy accident at your home, where an acquaintance falls down unexpectedly and injures themselves badly and you later find out that this acquaintance is not so friendly and has a desire to hold you accountable for their incident. Those with kids that may have kid friends over and a similar occurrence from above happens. Anyone who drives the streets today has some possible liability. As mentioned in our personal opener, the outcome of the personal situation could have been much different. Watch for a more detailed article in our coming Newsletter, meanwhile, if you do not have a PLUP, you may want to call your insurance agent and check into it! Have a Great “PLUP” Covered Day! Confidence left the capital markets with one possibly outlier economic report this month. While many have pointed to the Emerging Market Economies, looking closer we can see cross currents beginning at a different point and time. After reviewing the HEAVY material from our most recent Q 1 2014 Newsletter and our recent monthly review video’s we have decided to insert a Financial Planning tip of the month. This tip will come from the trenches of recent questions and we hope to break up the monotony of the heavy material, we financial Nerds get so excited about. So here is our first hot tip. If you have any liabilities that may expose assets to bad people, you need a Personal Umbrella Policy. For the annual price tag, the peace of mind this policy will give makes it well worth it most cases. Ok … On to our regular monthly review. With a consensus expectation of 200,000 new hires for the month of December, a print of 74,000 was where it all started. Recall the polar vortex we have all experienced. While the numbers are not SUPPOSED to reflect this, actions speak louder than words. This may be a one time event. Next Friday, February 7, 2014 we will get the January report, which will be very important. We will be watching closely. There are many sayings on Wall Street, often comparing Bond guys (can see their thoughts through interest rates) to Equity guys (can see their beliefs via Dow, S&P) most of which make fun of each other. Interest rates are saying there is a problem. The FOMC is reeling in stimulus which should allow rates to rise, however they are falling. 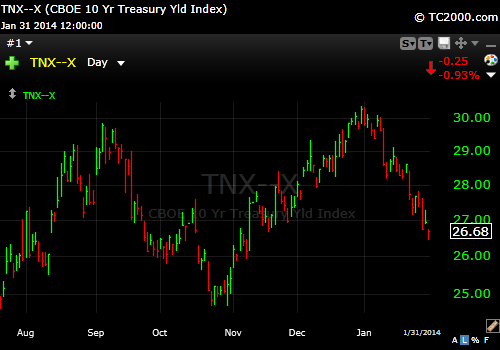 Bonds (bond investors) are saying we are heading into a serious slowdown. Equity markets ignored much of this until lately and then the many headlines blamed Emerging Market Currency fluctuations. The peak in rates from this chart, directly co-insides to the above mentioned Non- Farm Payroll report. Right or wrong, it is pretty easy to see now in hindsight what started making equity markets nervous. There is a tug – of – war going on between Bond guys (feeling scared/negative) and Equity guys (feeling a slight slow) which only time will tell who is correct.